Information and Technology Services (ITS) continues to work with BlueJeans Network to deliver industry-leading videoconferencing, content sharing, and real-time video to campus. Two new versions of the desktop app were recently released on MiWorkspace-supported devices, bringing the current version up to 2.10. Here’s a summary of changes. Private Chat (2.10) — Direct Messages allow you to chat one-on-one during a meeting, instead of with everyone. Room Pairing (2.9) — Easily join videoconference rooms into meetings and use the app as a remote. Moderator Video mute on entry (2.9) — Set meetings to have video turned off for participants. Moderator Pinning Support (2.9) — Choose a participant you want to stay on screen. Moderator Layout Controls (2.9) — Choose the layout you want all participants to receive. Note: An international calling feature is not available to U-M users. 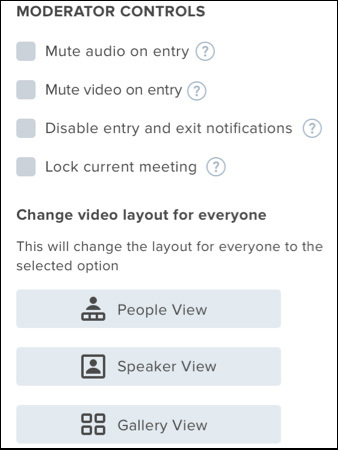 A screen shot of the BlueJeans desktop app shows new moderator controls to mute video on entry and to change the video layout for meeting participants. The “Turn off Camera” setting will now apply every time you return to the dashboard (2.10). Improved performance by freeing up disk space (2.9). Resolved an issue where background updates were not working (2.10). Outlook meetings would disappear from the dashboard (2.9). In the first quarter of 2019, a video upload capability will allow YouTube video playback through the screen share feature. A separate app is available for large meetings, called BlueJeans Events. Visit bluejeans.com/downloads and scroll down to Tools. Participants can also simply join BlueJeans Events from a web browser. BlueJeans Events provide a more controlled environment in which moderators can mute or promote presenters and stream to thousands of passive viewers.